Living in a major city such as Berlin I sometimes find it hard to remember where all the groceries, meats and cheeses actually come from and that they don’t just magically materialise in supermarkets. Visiting the local farmers market is my favourite way of bringing myself back down to earth. 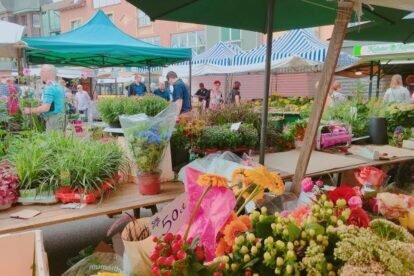 Kranoldplatz, a small square right beside S-Bahn station Lichterfelde Ost, transforms itself into a buzzing marketplace twice a week. There is always a lot to choose from: various fruit & vegetable stalls, a dedicated potato stall (my favourite! ), an organic butcher, bakeries, cheeses, spices, local honey… you name it. Apart from the food I also get flowers and plants here. The market is also full of options for a quick lunch: cakes and coffee, Bratwurst, or what I like to do: buy flatbread and a couple of cream cheese spreads to dip it in at the Turkish stall! It is always best to visit sooner rather than later- depending on the weather, most stalls start packing at around 13:00.